The secret lies in our patented cavity wall system by which an acrylic resin cured fibreglass mesh is attached to each face of the frame. When plastered the timber performs merely a structural role, with a lime/cement plaster on each face providing the insulation and finish. 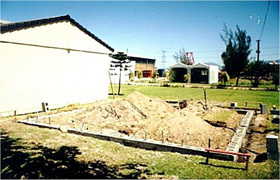 The foundation takes one day to set. A house of 40sqm will be erected in one further day, and will be roofed on the third. Mass concrete strip footings 200mm deep by 350mm wide in a foundation trench 450mm deep support a rising wall of 190mm concrete blocks over a brick grip damp course. The foundation plate of treated SAP 114mm x 38mm is secured by thunderbolt masonry screws. The walls comprise pre-fabricated timber wall panels of between 2500mm and 3000mm high and either 1000mm or 1500mm wide, erected on and nailed to the timber foundation plate plus a ring beam wall plate at eaves level. Clout nails and hurricane clips are used to fix the panels to the foundation plate, to each other and to the roof timbers. Acrylic resin impregnated fibreglass woven sheeting (Duramesh) is stretched over and stapled to both inside and outside faces, with a sheet of bituminous paper beneath the outer face as an added precaution against damp. Water pipes, electrical conduit, plug and switch boxes are installed within the panels at this stage, as well as door frames and clisco window frames of whatever size the house design requires. When erected and roofed, both wall faces are covered with a lime/cement stucco, starting with a stipple coat applied by a slush machine (or more properly a Tyrolean plaster machine) which is hand held. Thereafter two plaster layers are applied up to a total of between 20mm and 30mm. A typical mix is one bag of lime, one bag of cement plus three wheelbarrows of sand. The result is a nominal 114mm cavity between the two stucco plaster walls which are structurally robust, waterproof and have a 60 minute fire rating. Thermal efficiency is similar to that of a cavity wall of clay bricks and results in the most energy efficient product available. An in-situ concrete floor slab of between 75mm and 100mm is thrown over a damp proof membrane after the walls are plastered, and before painting and glazing. The floor level is the same as the top of the lowest horizontal member of the wall panels, and should be about 150mm above ground. 80m2 • 3 Bedroom, 2 bathroom with dining extension. Do these houses feel different? 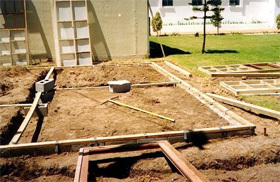 A finished READYKIT building looks and feels like one from brick or concrete. One of the many roles of Agreement is to make sure that the houses they certify will last longer than we will. Our oldest unit is now 15 years old and it still looks like it did they day it was built. As you would any other house. Unlike brick houses that settle a lot after the construction process, resulting in cracks, READYKIT homes do not settle, and even after many years remain crack free. Therefore the extent of maintenance is for the occasional coat of paint as would be the case for any type of house. Absolutely. Units can be added on without too much fuss. New panels are simply joined onto the existing ones and they are re-plastered. It is a very simple process. None at all. Designs are limitless. The system is also eminently suitable for classrooms, ECD centres, clinics, offices etc. Can you build double story?